Meathead Movers is here to take care of the heavy lifting for you on your move to Highland. Our clean-cut student-athlete Highland movers are ready to get you safely settled into your new home. Our Highland movers want you to feel welcome in your new home. Located in San Bernardino County, Highland has a diverse community with a vast landscape, great school district, and an active city life. From casinos to museums, this city offers fun and discovery for its residents. Nestled in southern California, Highland offers beautiful views of the mountains and the fields. This southern oasis rests just east of San Bernardino and offers everything from biking and shopping to dining and gambling. The nearby San Bernardino International Airport makes it easy to book tickets and fly out on business or vacation. The Highland Community Park provides a great place to venture outdoors and enjoy the fresh air. Moving to this beautiful city is easy when you have an experienced Highland movers team doing the work for you. For families, Highland offers several elementary, middle, and high schools. It also has Perris Hill Park nearby with baseball, picnic, and playground areas for children. The San Bernardino Community Gardens offers attractive views, and the San Manuel Indian Bingo & Casino offers a fun getaway for adults. With several plazas and malls in the area, Highland provides quick access to food and shopping every day of the week. From community parks to the San Bernardino County Museum, this city offers something to do for everyone. 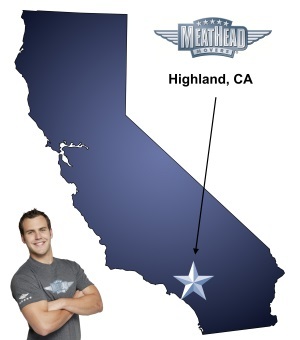 If you’re moving to Highland, let Meathead Movers take care of the heavy lifting. As your official Highland movers team, we guarantee to make your move a pleasant, hassle-free experience. Whether you need local, long-distance, commercial or on-site moving we offer a range of services to meet your needs. We also offer packing, storage, and our distinctive moving concierge service, which connects you with local service providers. All our clean-cut Highland movers meet our high standard by attending Meathead University, and staying smoke and drug free. If you’re moving to Highland and need a reliable company to help you settle into your new home, let Meathead’s student-athlete movers handle the heavy work so that you don’t have to. Contact Meathead Movers today for a free no-obligation moving quote, and experience the Meathead Difference. With our 100% satisfaction guarantee, the only thing you have to lose is the stress that comes from moving! Moving to Highland? Here are some helpful resources. Service was great, the guys were very professional. Fast, friendly, professional, polite, and super super helpful. The quickness of the guys getting things done. They hustled and worked faster than I could keep up with. The movers were quick, and arrived on time, looked clean and dressed appropriately for moving, and were very polite and courteous. Very professional! Supplies are expensive. It should be stated over the initial contact with the company that getting something pad wrapped will cost so much. Very professional, friendly and capable young men who took extraordinary measures to protect and move our belongings. From the beginning, we were extremely impressed with everyone involved in the process. Office staff (Frances) was great, while Nolan and Cole provided a level of care and expertise that would be hard to beat. It was Trevor's 2nd day on the job and he also certainly aimed to please. All were very personable and made the move a very pleasurable experience.